Let pro Overwatch players show you how frontline combat is done. Tanking in Overwatch is often a thankless job. People expect you to just exist and stand in the way of damage, never appreciating how difficult good positioning and survivability are to maintain. As if that wasn’t bad enough, a good number of your teammates may start barking nonsense like, “No Winston. 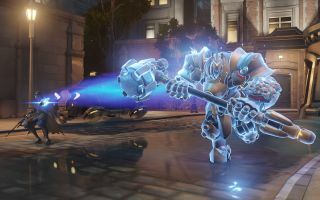 Reinhardt, please.” While Reinhardt is an archetypal tank to be sure, the rest of the tanking roster can take a beating just as well and fulfill a number of other functions at the same time. All you need is a little map knowledge and cooperation to bring out the best in your tank of choice. Let’s take a look at how all the meat shields stack up. If you’re new to the game and want to learn about tanking, no one will ever get upset if you pick Reinhardt over the others. Though Reinhardt isn’t exactly a Swiss Army Knife, his 2000 HP shield is enough to get the job done in most situations. Remember, your team will want you to be present and protect them from damage above all else. Not to over-simplify it, but keeping right-click held is all you will need to do sometimes. As soon as you have spatial control and the other Rein’s shield goes down, it’s time to ult. If you’re on the receiving end of an assault, do your best to not let your shield break. It will be put on a short timer that often spells the end of your defense or attack, so call out when your shield is low and take cover for a few. Zarya has been a staple in most compositions for quite awhile now, and her tools make her shine even more with the abundance of mobile DPS swarming the battlefield. Her castable shields are invaluable in clutch situations where low-HP teammates have to skirt around, or through, fortified areas to land critical ultimates. Combine this with the fact that damage to her shields powers up her weapon and you have a very attractive tank pick. Let’s ignore that Mei wall, shall we? Heads-up plays like this are the reason that Lunatic-Hai defeated Kongdoo Uncia in the Group A decider at Apex last week. D.Va has also been a popular pick because of her ability to challenge DPS heroes on the high ground while supporting her own glass cannons. Maps like Oasis and Numbani can be troublesome if you can’t swat away those pesky Pharahs and 76’s hanging out on high ledges, so jump in a Meka and team up with Genji for some chimney sweeping. Feeling powerful, and I’m not even angry! If there’s one Winston player to pay attention to, it’s Miro. He puts Butcherr on the hook for Zunba with remarkable ease and places a beautiful shield to keep him safe in the process. If you can talk to your team and call out targets, you’ll have a great time playing Winston. He partners well with every healer, and his ultimate can be a nice weapon on stubborn points like point B on Anubis. The key, again, is communication since you’re going to be jumping around and distracting people. If you can get your DPS and healers to dive with you, you’ll enjoy plenty of success. Just remember to jump to safety when you need to! The internet is holding its breath to see what sort of impact Orisa will have on the meta. At the moment, many pros and casters feel as though she’s powerful enough to see a lot of play time at the highest levels of competition. According to PVP Live, her Fortify ability is going to add a lot of longevity to pushes that would have otherwise been CC’d into the ground. One thing is for certain: it’s going to be very nice having a tank with some true suppression fire, as well as another hero with a damage-enhancing skill for the team. Will that mean fewer Ana picks? Will the loathsome tank meta make a return? We keep asking, but will this mean Sombra’s potential will finally be realized? We’ll see in a few short days. Watch Orisa in action here.